Bug bites are typically nothing to worry about. Sure, they can be itchy and painful, but they usually go away on their own or with a simple topical treatment. Once in a while, however, our casual attitude toward bug bites causes us to overlook a serious — even life-threatening — condition. 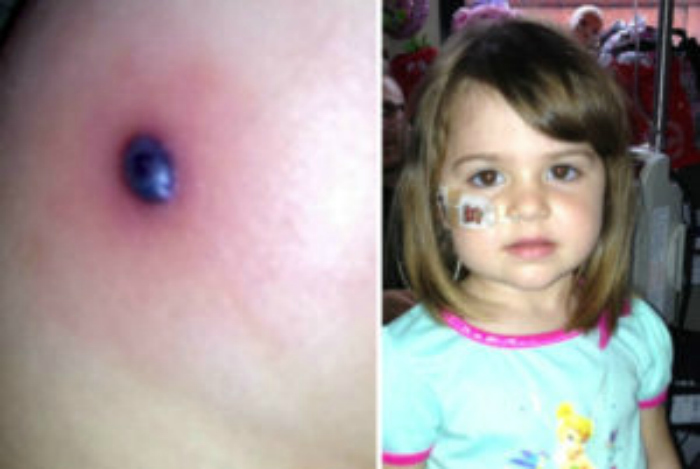 After returning from vacation, one mother assumed that her daughter had a simple bug bite… but it soon turned into every parent’s worst nightmare. Hayley Williams, 25, of Binghampton, England, grew concerned when her 3-year-old daughter, Connie, wasn’t healing from a bug bite she received during their family vacation to Ibiza. “It wasn’t until the next morning when I saw it go black that I thought it wasn’t quite right,” Hayley said. After a blood test, the horrible truth was revealed: her body reacted unusually to the bug bite because she had leukemia. The good news was that doctors were able to catch it early. Thanks to some aggressive chemotherapy, Connie’s cancer was finally in remission. Hayley said “that insect bite was a Godsend, because we wouldn’t have caught [the cancer] when we did.” She’s still in shock about how easy it was to mistake such a serious condition for something so innocuous. Connie is expected to be completely cancer-free within two years! This just goes to show how important it is to get checkups and inspect unusual bites or marks on your body, especially ones that appear from out of nowhere. Don’t hesitate to go to a doctor if you suspect something’s not quite normal!